Surrounded by picturesque vineyards and close to the ocean, Camping Médoc-Plage delivers an unparalleled luxury camping holiday experience. Nestled within a lovely pine forest, the campsite is an ideal setting for your next camping trip thanks to excellent services and a great location. During the summer, bread and pastries are served fresh at the campsite’s bakery. You can also enjoy a snack at the bar. Events and activities are organised for children and adults, and you can also conquer a climbing wall during high season. Other perks include laundry facilities and Wi-Fi access. For a fun and luxury camping holiday, book your stay at Camping Médoc-Plage with LuxCamp. 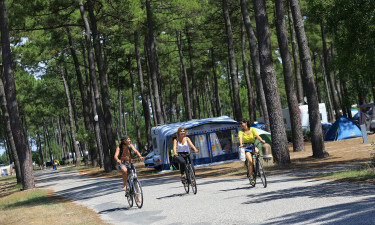 Situated in Montalivet close to the Gironde estuary, there is no shortage of things to do at and near Camping Médoc-Plage. Fabulous facilities at this luxury camping site include a beach volleyball court, a multi-sport pitch, table tennis and football, and bouncy castles. There is also a service area for your mobile home just 400 metres away. This idyllic holiday camping destination on the eastern coast of France is only 950 metres from the beach. Walking and cycling paths lead to the shores of the Atlantic and nearby villages of Le Médoc, Saint Estèphe and Pauillac. 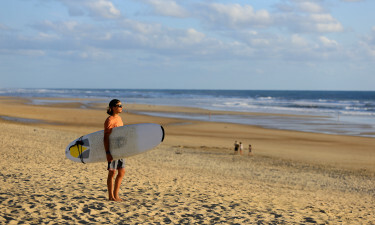 You can also explore the Gironde estuary and vineyards dotting the landscape. 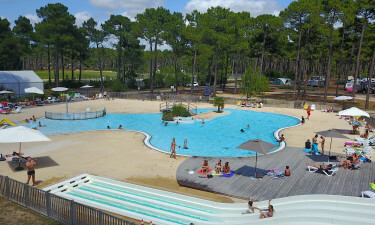 Camping Médoc-Plage has a stunning heated pool for the ultimate luxury camping experience. There is a wading pool for children and four thrilling waterslides. A hot tub and solarium are also available for you to relax. For indoor fun, there is an entertainment marquee with games and other activities.